Bengaluru FC’s Super Cup defence ended with a 2-1 quarterfinal defeat to Chennai City FC at the Kalinga Stadium, in Bhubaneswar, on Thursday. Goals from Nestor Gordillo (15’) and Pedro Manzi (54’) put Chennai ahead before Sunil Chhetri – who had missed a penalty when the Blues were a goal down – nodded home from a corner (65’) to give Carles Cuadrat’s men a chance to claw back into the game. Dominant in attack for better parts of the game, Bengaluru ran into an inspired show from ’keeper Mauro Boerchio who did more than just well to keep the ball out from hitting the back of his net on several occasions. 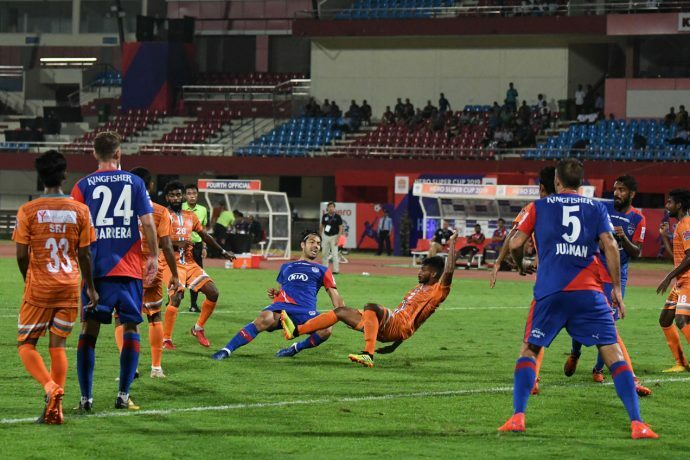 Chennai, resorting to play the ball long, used the route to grab the opener in the 15th minute, but it was more to do with an error in the Bengaluru defence that let Gordillo score. A breakdown in communication between Harmanjot Khabra and Rahul Bheke in attempting to deal with a long punt, saw Gordillo capitalise and score past Gurpreet Singh Sandhu. The Blues had chances in quick succession and then through the rest of the half, but much to Carles Cuadrat’s frustration, they didn’t manage to put anything away. Xisco Hernandez, Miku and Sunil Chhetri – all saw attempts on goal kept out by Mauro Boerchio in Chennai’s goal. Chhetri had the chance to pull Bengaluru level in the 51st minute when he had his shirt tugged in the Chennai box by Romario, prompting the referee to point to the spot. But Boerchio guessed the skipper’s take from the spot correctly to keep it out. The miss would soon come to haunt Bengaluru who minutes later, went behind for a second time. Bringing down a long drive from Sandro, Manzi cut on to his right before curling the ball past Gurpreet to make it 2-0. The Bengaluru skipper soon made amends for his miss, calmly rising to direct a header home from a corner in the 65th minute and give the Blues a way back into the game. The Blues could have had an equaliser minutes later when Chhetri picked Dimas Delgado with a pass only for the ’keeper to tip over the Spaniard’s goal-bound header. It seemed to be Boerchio’s night when he managed to get to a shot from Chhetri that looked almost certain to roll in, in the 87th minute, as Chennai saw out the game.